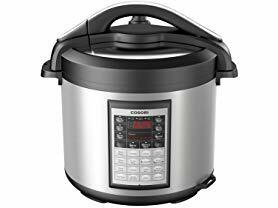 Right now at Woot.com this COSORI 8 Quart 8-in-1 Multi-Functional Programmable Pressure Cooker is just $59.99 (Reg. $99.99)! •Meat/stew, poultry, soup, beans/chili, white rice, brown rice, multigrain, steam vegetables, slow cook, yogurt, pasta/boil, steam potatoes, fondue, saute/brown, bake, reheat, keep warm. •Includes a glass lid, extra silicone sealing ring, to start your pressure cooking journey with COSORI online recipes. The stainless steel pot includes 6 pressure levels for customized cooking. •ETL, cetl, FCC & FDA-approved; 9 safety mechanisms ensure safe operation for daily use by beginners or professionals. Also comes fully equipped with a glass lid, extra silicone sealing ring, stainless steel steam rack, ladle, rice spoon, and measuring cup. Offer valid 9/16 only and while supplies last. Shipping is FREE for Amazon Prime Members or only $5 flat rate.